Welcome to the Topsail Island area! Topsail Island is one island in a chain of barrier islands located along the North Carolina coast, midway between the mainland cities of Jacksonville, NC to the north and Wilmington, NC to the south. Topsail Island itself is situated in both Onslow and Pender counties and is home to the three seaside towns of North Topsail Beach, Surf City, and Topsail Beach with each providing a unique ambiance all its own. Offering 26-miles of expansive shoreline, pristine beaches and a quintessential beach vacation experience, Topsail Island has quickly become a popular vacation destination for couples, families and beach lovers from all over. Both residents and visitors alike consider Topsail Island a "hidden treasure" for two reasons. One being that the beautiful serene beaches are uncrowded and surrounded by local mom and pop stores, which makes for a truly peaceful place to vacation or live. The second reason is the legend that Blackbeard hid his treasure on Topsail Island. Prior to WWII, treasure hunters searched for the hidden gems and gold throughout the islands' maritime forests. Topsail Island (locally pronounced Top'sul) is said to have gotten its name from the popular belief that pirates used to hide in the channel between the island and the mainland waiting for merchant ships loaded with goods to pass. The pirates would attack the ships and claim the cargo as their own. Eventually, the merchants became aware of the hiding place and began looking for the topsail, which was supposedly the only part of the pirate ship that could be seen by the passing victim. Topsail Beach is located on the south end of the island. Topsail Beach is home to the Missiles and More Museum, which exhibits Operation Bumblebee when the U.S. Navy took over the island during World War II. With it’s rich history, Topsail Beach is a popular residential and tourist destination. Topsail Beach is known for it's "retro, laid back" feel with mostly residential areas and quaint locally owned shops and restaurants in the center of town, such as the popular Topsail Beach Skating Rink attraction (which has been around since 1964). You will also find the coveted area of the "southern tip" of the island which provides a quiet beach on the Intracoastal Waterway side of the island and a calm, relaxing atmosphere. It’s no wonder that Topsail Beach has recently been voted Best Little Beach Town in the USA by TripAdvisor, the world’s largest online travel site. Surf City is located in the heart of the island and is home to the Surf City Ocean Pier where visitors can get a scoop of ice cream and walk or fish on the 937 ft long pier. Surf City is a popular tourist attraction with several shops and restaurants within walking distance of each other and is the home of the favorite tourist attraction, the Karen Beasley Sea Turtle Hospital . Surf City also features one of the island’s largest public parks, Soundside Park, where concerts, outdoor movies and other special events take place year round. North Topsail Beach is located on the north end of the island towards Sneads Ferry. In fact, it has an adjoining high rise bridge with Sneads Ferry. North Topsail Beach is home to 2 resorts — Villa Capriani and the St. Regis — and the Sea View Restaurant and Fishing Pier (one of the longest piers in North Carolina). North Topsail beach is known for uncrowded and serene beaches and some say it’s the best place to look for shark teeth along the sand. Just off the island, you will find the neighboring towns of Sneads Ferry, Holly Ridge, and Hampstead, known as the "mainland" to locals. These towns, while not technically located on the actual island, are still considered to be part of the greater Topsail Island area. Sneads Ferry is known mainly for it's vast commercial fishing and residential setting, but is also home to the famous Shrimp Festival. Sneads Ferry is located in Onslow County just off of North Topsail Beach, NC on the mainland side of the high rise bridge and just south of Jacksonville, NC. Mostly a quaint little fishing village, Sneads Ferry offers their guests and visitors a variety of waterway delights from Jet Ski and Charter Boat rentals to some of the best fresh local catch in restaurants or to take home. 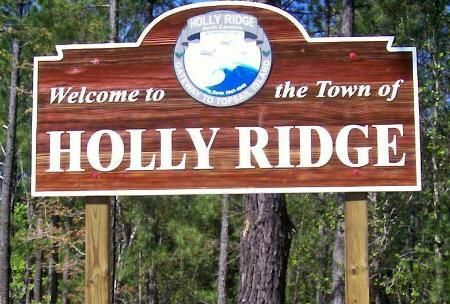 Holly Ridge is located on the mainland side of Surf City, NC and is centered between the towns of Sneads Ferry and Hampstead. Many call Holly Ridge the "Gateway to Topsail Island Beaches" as you must cross through the town before reaching one of the two bridges onto the island. Holly Ridge offers an abundance of outdoor opportunities in their natural coastal areas and has strong military ties as it was once the home to historic Camp Davis. Hampstead is located just south of Topsail Island on the mainland and a few miles north of Wilmington, NC. It is known as the "seafood capital of the Carolinas" and proudly hosts the famous annual NC Spot Festival. Hampstead is home to many great golf courses, such as Belvedere Country Club, Castle Bay Country Club, and Olde Point Country Club to name a few. Conveniently located around Highway 17, Hampstead provides it's visitors easy accessibility to travel south to Wilmington, NC or north to Topsail Island or Jacksonville, NC within a matter of minutes. Be sure to contact us at www.accessthebeach.com for the very best in Topsail Island area vacation rentals and sales. You will be so glad you did.